4. Where Did We Go Wrong? A very solid album from these two. 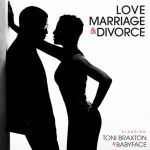 It's great to see Toni Braxton back in the limelight she still has a great voice, even though it has matured a lot from her 90s and early 2000s days. She sounds good and her solo tracks are a highlight on here. It's a cool concept for an album too, and an enjoyable listen from start to end. 4.5/6.